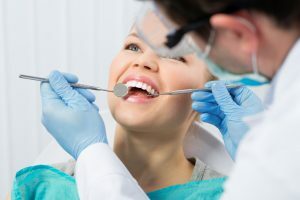 The Benefits of Regular Dental Hygienist Visits | Smile Logic, Inc.
Dentists may get all the accolades for straightening, whitening, and saving teeth, but they’re always backed by a team of trained dental hygienists, who you’ll probably spend more time with than the actual dentist! Hygienists know your mouth from the inside out and have seen every teeth-gritting scenario you can imagine. These professionals are there to make your visits more comfortable and more successful. Read on to find out why regular dental hygiene visits can give you something to smile about. If all superheroes wear some form of a mask, then perhaps a dental hygienist is at least part superhero? Well, persons in this profession certainly perform major feats every day. Dental hygienist services are far more than just handing the dentist a specific tool. Without regular visits to a dental office, you risk periodontitis, which can then lead to major illnesses including stroke, heart disease, premature birth, arthritis, and respiratory problems. Dental hygienists are masters of their trade, and they have discovered issues such as dementia, acid reflux, vitamin deficiencies, and osteoporosis just by looking inside their patients’ mouths! Why not just open wide? Deep cleaning or periodontal therapy. Yes, this can be scary, but your hygienist will ensure you are informed along the way, including with suggestions on pre-appointment painkillers or other anti-anxiety medications. But it’s also so necessary. Tooth decay is not something you want to be dealing with. You get one real, permanent set for life. That’s it. X-rays. They’re not just something your insurance orders every year or so. Yeah, you can’t really go it alone. Despite regular brushing, flossing, and mouth washing, we just can’t get our teeth as perfectly clean as they need to be. Relax, you’re in expert hands. And her hands are in your mouth. Now it’s your turn. Want to brag about conquering your fears of the dentist? Share your story below and be an encouragement to our readers. Have questions or want some recommendations of dental hygienists in your area? Post and we’ll serve those up faster than you can swish and spit.